Ben Bey was arrested last month for allegedly having a fake license plate made out of cardboard and crayons. Bey, whose license is suspended, said that he doesn't believe in government-registered license plates. He said this image was what was affixed to the rear of his vehicle at the time of his arrest. FAR ROCKAWAY — A Queens tire collector whose license has been suspended 166 times was arrested for driving with a fake license plate that looked like a kid's art project, police said. Ben Bey, 50, was busted on July 8 while driving his 2001 Ford van with "a rear license that had not been issued by a government agency, and appeared to have been fabricated by defendant Bey using cardboard and crayons," according to court records. 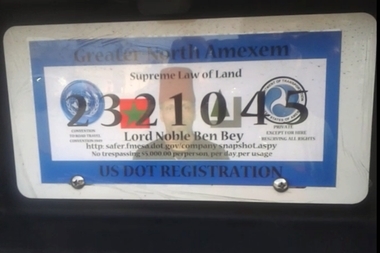 The bogus plate also bore his picture with the title "Lord Noble Ben Bey." The plate also had the words "Greater North Amexem" and "Supreme Law of Land." When an NYPD officer stopped the van, Bey referred to himself as a diplomat and said, "I am an Amir and I don't need plates to drive," according to court records. He also handed the officer a phony driver's license that showed a picture of Bey with his name and the words "Moorish National, Ancient Moabite." The ID also said it was for "International Road Travel," was issued on May 8, 2014, and expires May 30, 2018. Bey was arraigned in Queens Supreme Court and charged with a felony for aggravated unlicensed operation of a motor vehicle and a misdemeanor for driving without a proper inspection sticker. He was also hit with a slew of moving violations including not having insurance or a registered license plate, records show. Police have also filed civil forfeiture papers to seize his vehicle. But Bey told DNAinfo New York that the charges are bogus, claiming he doesn't need a driver's license or a license plate to cruise city streets in his van. "I don't deal with the Department of Motor Vehicles. I don't deal with their licenses," he said. "It's my private property." Bey, who was arrested under the name Ben Bay, belongs to the Moorish Nation, a group, he said, that includes people of African descent. The Moorish Nation, he said, believes that many people in the United States don't need to pay taxes or have licenses. The Southern Poverty Law Center has described it as a sovereign group. Bey said the officer who arrested him got a lot of facts wrong. He claims he never said he was a diplomat and never intended the cardboard cut-out to serve as a substitute license. "It’s not a license plate. It’s my picture. It's my personal property. I can have whatever I want to have on it," Bey said. He provided DNAinfo a picture of what police said he was passing off as a license plate. The image shows his picture, says "US DOT Registration" and has a seven-digit number across the center. Bey said he has the right to put any image he wants on his car. He said he doesn't believe in the DMV because it is breaking the law by "forcing people to have licenses" when they are driving their cars for non-commercial reasons. Bey's driver's license has been suspended since 2000 and has been suspended 166 times before that, according to a criminal complaint. Bey, who went by Ben Stevens before joining the Moorish Nation about eight years ago, lives in Far Rockaway and spends his days driving around looking for tires which he repurposes as flower pots. "I give them to churches," he said. He makes money, he said, going to court to help people — not as a lawyer, but as a "public minister." "I get donations. That's how I live," he said, adding that he doesn't pay taxes. He said he intends to fight the charges. But he's lost a previous case for driving with a phony plate. He was sentenced to nine months in jail in September 2013 after pleading guilty in Manhattan Supreme Court to a felony charge of criminal possession of a forged instrument and aggravated unlicensed operation of a motor vehicle, records show. Bey was busted in March 2013 on the Robert F. Kennedy Bridge for driving with a bogus steel license plate that had a sticker affixed to it. Bey said he only pleaded guilty because it was the only way he could get out of prison. "Every time they say it’s a phony license plate," he said. "First of all it’s not a license plate. On my private conveyance, I can put anything I want on it."